Some months ago I was going through my pantry and noticed that I had a whole packet of unopened hazelnuts. That’s very me unfortunately. It’s no news that sometimes I tend to buy food stuffs without really planning ahead. I’m improving though…Honest! Solution: Twitter and the lovely James Tanner. 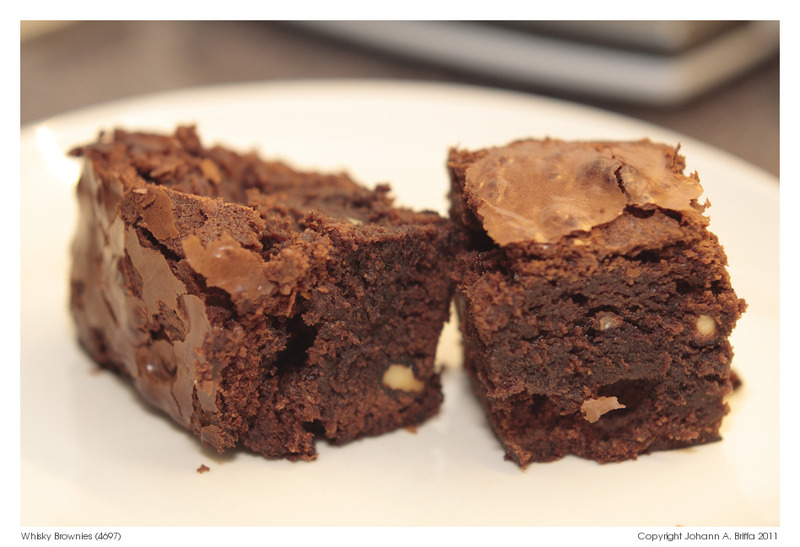 James kindly sent me a link to his recipe for Chocolate Nut Brownies. I changed it slightly because I had to work with what I had in the pantry at the time but the result was fantastic all the same. I’m no expert when it comes to alcohol so I just put my hand in the drinks cabinet and grabbed the first thing that was in there. That turned out to be a bottle of Islay, which was a good choice. Also I used 300g of hazelnuts instead of the selection which James uses because that’s all I had. Anything you use will be great anyhow: one of the beauties of these rich chocolate babies. You will love them. James, thanks again for this recipe. It was a hit. Preheat the oven to 180ºC/Gas mark 4, and line a 2 inch deep, 12 inch square baking tin with parchment paper. Melt the chocolate and butter in a small bowl over a pan of simmering water, and make sure that the water doesn’t touch the base of the bowl. Stir occasionally. In another heavy-based pan, gently heat the whiskey (or water) together with the coffee granules until these dissolve. With an electric whisk, beat the eggs and the sugar in a medium bowl, also over a pan of simmering water, until the double in volume. This is called a Sabayon or Zabaglione. It should turn light and pale. Remove from the heat and set aside. Slowly fold in the melted chocolate mixture into the Sabayon. Be gentle so you retain all that lovely airy texture. Now mix in the hazelnuts. Bake for 25 – 30 minutes. Leave to cool slightly and cut into squares. Note: If you don’t have an electric hand whisk you can still make these brownies but it will take *a lot* of whisking. But it’s not impossible. Take it from me – I tried and tested it!